The aim of piglet producing is to have as many piglets per sow per year with as little costs as possible. 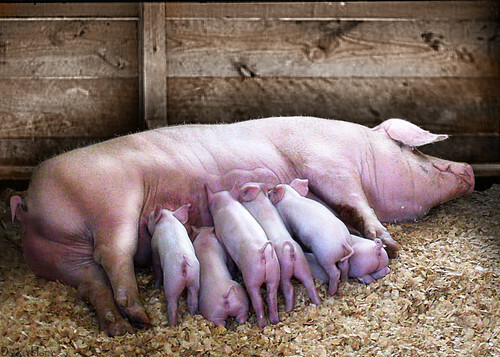 Approximately sows give birth 2,3 times a year. One farrow has 10-17 piglets, of which a few often die at birth or soon after. Between birth and weaning, the mortality can rise up to 13 %. About 11 piglets are weaned from each farrow, and 21 piglets / sow / year. Length of lactation period: Reducing the lactation time reduces fertility and number of piglets born. However, the sooned the piglets are weaned, the sooner the sow comes into heat and can be inseminated. Time from weaning to insemination: Sows come into heat twice after weaning. First heat is two days after weaning, but insemination at that time does not lead to fertilization. The other heat is 4-7 days after weaning. If the sow is not inseminated then, it takes three weeks before it comes into heat again. Mortality of piglets: Reducing mortality directly increases piglet production. More piglets die in large farrows, so increasing farrow size is not the only solution. Number of piglets in a farrow: To avoid high mortality, large farrows must be evened out between lactating sows. Mortality rate can be over 40% in farrows of 18 piglets or more. Each sow has fourteen teats, so they cannot nurse more piglets than that. Breed of the sow also affects its "efficiency". Mixed breed sows (local breed + yorkshire) have larger farrows and have their first farrow younger than purebreds. Pigs to be used as parents are selected at the weight of 80-90 kilos. They need more space than finishing pigs so they can develop strong muscles, and they should be fed more freely. Abundantly fed sows grow more, release more egg cells per ovulation, come into heat earlier and have their first farrow at a younger age, but their feeding costs are higher than limited-fed sows. Growing gilts need almost as much feed as growing pigs. Young boars are fed 10% less than growing pigs. Both gilts and young boards nees as much amino acids as growing pigs. The ideal time to inseminate a sow for the first time is at 210-230 days of age. The sow's heat lasts 20-72 hours, usually 36-48 hours. Ovulation occurs 30-36 hours after the heat begins, but the eggs live only 8 hours after ovulation. Sows should be serviced (inseminated or mated) 10-30 hours after the heat starts, before the ovulation. Sperm cells need six hours in the uterus to adapt, before they can fertilize the eggs. If the sow is serviced during the optimum time, she will have a better chance of getting pregnant and a to have larger farrow. Young sows release 10-20 eggs in one ovulation, and older sows 15-25 eggs. Free feeding before service increases the amount of eggs released. Eggs, which are fertilized, stay 12 days floating free in the uterus. Up to 30 % of the fertilized eggs will die during this phase.This phase is called preimplantation. The implantation phase is on days 13-40 from insemination. During implantation the eggs attach to the uterus, the placenta develops and fetuses are formed. The fetus phase lasts until the end of the pregnancy. Sows are pregnant "3/3/3": three months, three weeks and three days. 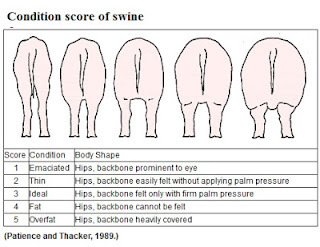 Approximately 115 days after the insemination the sow will give birth. Gestating sows must get enough feed and especially protein for the fetuses to develop. If the sow gains too much weight during gestation, it will eat less after farrowing and lose a lot weight during lactation. Weightloss reduces fertility in the next heats. The condition score at insemination should be 3,5, and 3 right after weaning. 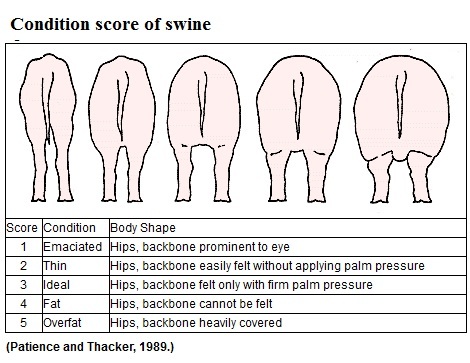 Condition score is evaluated after second insemination (gilts) or after weaning (older sows). Each sow should be fed individually during gestation. In practice they follow two phase diet. During gestation, they need 40-43 MJ ME/day, gilts needing more than older sows. Sows with a lot of moving space need slightly more feed. The feed must be fibrous, so the sows need to spend time eating and feel more satiated. It should have 5 g of intestinally digestable lysine per feed unit, or 12-14 % of crude protein. The feed can be "lactation feed" which has been diluted with grains. Young sows need more feed than old, because they still grow themselves.Thin sows (condition score 2 or 3) can be given 3 units a day. Five days before farrowing the amount of feed is cut drastically to less than 2 units a day. This will empty the intestines of the sow, making farrowing easier. Hay or straw should be given freely to avoid constipation. Lactating sows can be fed little during the first few days after farrowing, when their appetite is usually very low. Otherwise the feed will just spoil. After that sows are fed according to recommendations. Gilts need 80 MJ ME/day, but when the piglets grow, the amount is raised up to 93 ME MJ/day before weaning. Older sows (farrowed five times or more) need 85-98 ME MJ/day. Piglet feed can be mixed to the sow's lactation feed to ensure palatability and energy content. The feed should have 15-18 % of crude protein, and 42-51 grams of lysine a day. Protein need depends on farrow size and lactation phase. Sows also need enough calcium (8 g / feed unit), 6 g of P and 4 g of salt. Vitamins, magnesium, iron, zinc, copper, iodine and selenium are also important, and easily gained from a premix or concentrate. Feed for lactating sows must be palatable, and can be given several times a day to ensure adequate eating. Inadequate feeding during lactation increases the dry matter content of the milk, but decreases total milk yield and protein content. Underfed sows also lose more body fat and muscle. Their piglets grow less, and have less protein and more fat than piglets from an ideally fed sow. It is more effective for a sow to get energy using its own tissues than from feed, so some weight loss is likely even for an ideally fed sow. See details from Formulating farm-specific swine diets (University of Minnesota). Piglets are born without any immunity or ability to thermoregulate ( = to regulate their body temperature). The temperature inside the sow's womb is nearly 40 C, but only 20 C in the piggery, so piglets are cold and need a heat source to stay warm. The pen has to be clean, desinfected and have enough straw or other dry litter. New-born piglets weigh about 1,5 kilograms. 50-70 % of new-born piglets weighing less 800 g die soon after birth. First born piglets get to the sow's teats sooner than others, and usually grow faster. They need colostrum during the first hours to build immunity, and to get energy for maintaining body heat. Colostrum is also rich in fat, lactose, vitamins, minerals and proteins. Piglets cannot mobilize their own tissues to get energy. Lack of milk causes the blood glucose level to drop, which makes the piglets drowsy and weak, and unable to seek nutrition. As their body heat and glucose levels continue to decrease, the piglets will fall into come and die. Weak and last-born piglets can be guided to the teats. Piglets suckle 20-23 times a day, about 5 minutes at a time. Most of time is spent butting the udder so the milk is released from the alveols. Suckling piglets get milk only for half a minute, about 0,6 dl each. The milk yield increases at each parturition from 8 to 10 kg / day. Number of piglets increases the milk yield as well, but only little, so each piglet gets less milk if the farrow is large. The sow calls the piglets for suckle with low grunts. If the piggery is noisy, the piglets cannot hear the sow, and will die soon of malnutrition. Noisy piggery also prevents the sow to hear its piglets screaming if she accidentally is laying down or sitting on them, making it impossible for her to watch out for her young. After the first week solid food should be offered to the piglets. For some piglets this becomes an important source of nutrition. Their intestinal epithelium, enzymatic activity and stomach acid formation develop faster if they get solid food in addition to milk. At weaning these piglets are better prepared to eat only solid feed. Their chance to get diarrhea and lose weight is decreased. They also may be calmer if they've used the feed as a stimulus. Best ingredients for piglet feed are wheat and peeled oats. Small amounts of oats, barley, and whey can also be used. At three weeks of age the piglet starts to develop its own immune system, and is no longer dependent on milk. This is also the time they are weaned, and the stress combined with low level of immunity often causes diarrhea and even deaths. If the piglets are weak or small, it is recommended to postpone weaning until the piglets are four or five weeks old.